Another thing it has going for it is that it is only $1.99 for the Kindle edition. The volume that I have is from when books were built like tanks. I paid more for it, but it has lasted more than forty years. It is not meant to be a straight biography of all these great, and not so great, men. It is meant by the author to show his own morals and how these men stacked up to them. The very great part about his books is that they are really the only biographies from anyone near the actual time they lived. 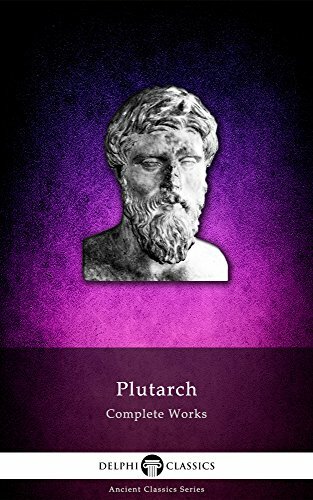 Plutarch does get his moralizing in, but for the most part you also get the full biographies of his subjects in it. To those of us who are into Ancient history maybe you can relate. I was reading this book when my first child was being born. This was after the husband couldn't be in the room, and before we had to take classes to be in the room (I am still confused about the classes, because my role was pretty secondary to the action going on). The birth was imminent and my wife was surrounded by nurses and doctors. This birth was the only one during the daylight, so we had a lot of hands on deck. It was so crowded around my wife's bed that I couldn't even see her if I wanted to. So I stayed on the couch and read page after page of Plutarch. That is until a nurse came to me and said "Mr. Peterson you may want to see this". She was both right and wrong. Some of it was glorious to see, and some not so much. Anyway, the book has been with me during all of the most important times when I have had to wait around. I hope you find as much enjoyment out of it that I have.